There are many sounds contained in this collection of recordings made specifically with my producer and beatmakers in mind. Chop them up like an old record and use them to add layers and lines to your productions. Open Horn sounds, as well as lines, hits, and Harmon Mute layers and tones are included. THE FLUGELHORN is a warm tone version of a trumpet. I prefer it to a trumpet for most horn sounds. This is the horn i play on my songs. WHY DIRTY? Because this is HUMAN made. Computer notes and fake horn tones do not have the warmth and rawness of the real thing. IS IT CLEAN RECORDING? YES. Recorded w 2 mics. One Audio Technica in front of the horn and One Neumann for subtle room sound and added depth. 18 TRACKS will be available for downloaded upon payment. – Stabs, Long Notes, Short Notes, Layered chords, Solo sections to chop and Harmon Mute versions as well. An Audio Playground. – No compression or added reverb so that you have complete control over the sounds. Chop, edit, compress, eq, limit, layer, pitch, and stretch them as you like. – Only your imagination and ability will limit you. 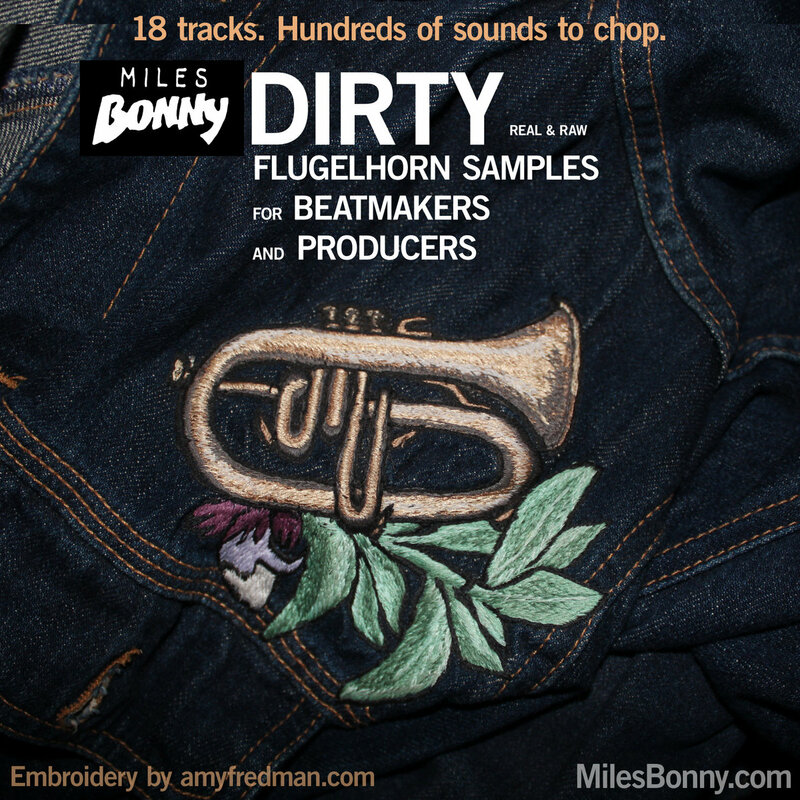 Want a custom horn arrangement recorded over your song? I can do that too. Contact Miles@MilesBonny.com with inquiries. ENJOY!